This product is Unrefined, which means it is in the purest form that it can possibly be in. 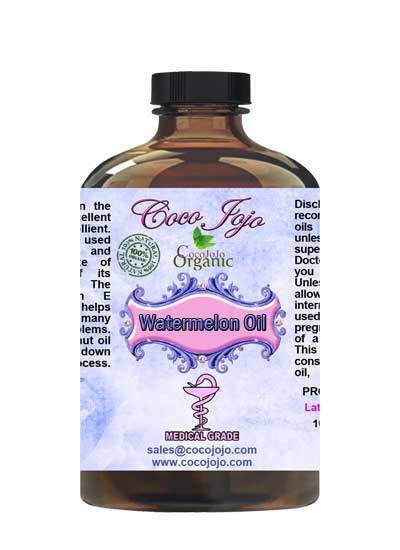 Watermelon Seed Oil 100% Pure: Unrefined Pharmaceutical Grade A contains Linoleic Acid which is wonderful for the skin, as well as for cardiovascular health. Watermelon seed contains a large amount of omega 3,6, and 9 fatty acids, which are often used to help with the immune system, cardiovascular system, nervous system, and promoting healthy skin. This product is Unrefined giving a more potent concentration of all the nutrients, it also gives the oil a lighter color than its refined counterpart. Watermelon seed oil absorbs quickly into the skin and creates a protective barrier to prevent excess evaporation of natural moisture. Thanks to its amazing profile of antioxidants, vitamins, and essential fatty acids, watermelon seed also contributes to skin health and regeneration. 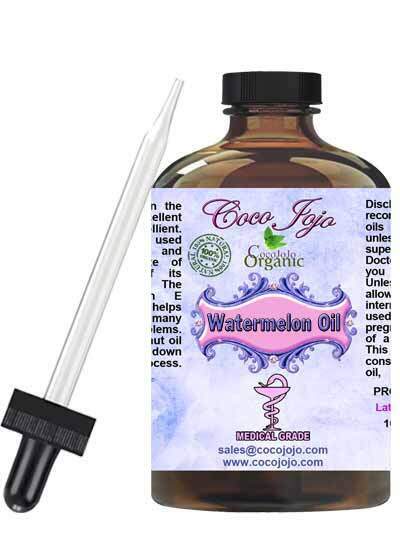 Watermelon seed oil is used to add shine to flat, dry hair. HOW ARE COCOJOJO PHARMACEUTICAL OILS USED?